Running a sports arena can be expensive, be it maintenance costs, employees, leases, or other expenses. If you can find a way to reduce costs and improve the product for your paying customers immediately, wouldn’t you jump on that opportunity? Replacing outdated lighting systems with LED lighting can do just that, and we’re here to show you how. There is a reason that the LED sports lighting market has grown by over 300% in the last few years—it is an incredible investment that more and more facilities are taking advantage of. Changing the lights high up in the rafters or on massive fixtures isn’t easy, and it definitely isn’t cheap. So why would you want to change them 4 times more often with lesser lighting? Many LED lights are rated for 100,000 hours or more, so you’ll rarely have to hire someone to go up to no-man’s-land to replace or maintain them. Both Arizona State and Notre Dame colleges have replaced their outdated lighting systems with LED lights on their basketball courts, and many others are following suit. They both expect to save up to 20% on electricity costs. The Staples Center in Los Angeles has gone with LED lighting as well, reducing their energy costs by 25%. Their initial investment in LED lighting will pay for itself in less than 36 months, and that doesn’t even include the maintenance cost savings. The Carolina Hurricanes installed LED lighting systems in 2014, and the manager of PNC Arena, Dave Olsen, expects them to outlast the entire building. Rather than replacing his lighting system every few years, he won’t have to replace them for 20 years or more. There’s a reason why over 85% of sports arena operators who installed new lighting went with LED. Heavy duty, lightweight, and long-lasting designs can withstand corrosive atmospheres and high temperatures. An environment that may be wet or warm like a natatorium or swimming pool has an incredible advantage with LED lights, and maintenance will be reduced for years to come. 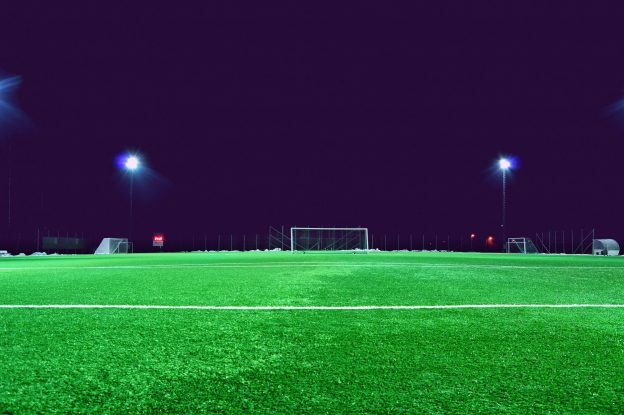 Not only do LED lights age better than metal halide by maintaining brightness and color, but they also provide a better experience for fans and players. They provide bright light to hard-to-reach areas and eliminate shadows at half the cost. A majority of U.S states have energy rebate programs that can save an arena owner up to 25% on the costs of an installation project. This can decrease the return on your investment substantially, with LED lighting paying for itself in less than a few years.